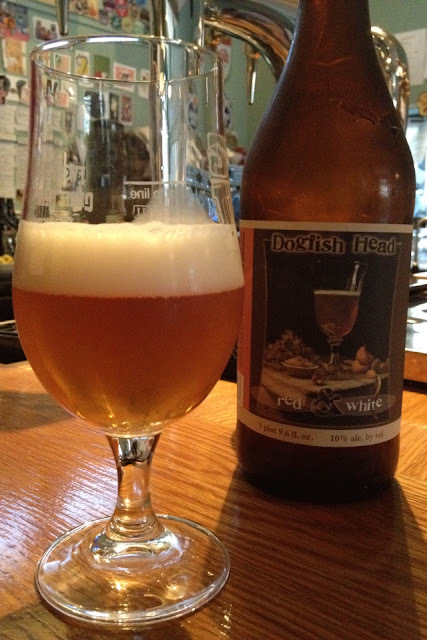 I tried Dogfish Head Red & White a fair few weeks ago now, but up until today hadn't realised I'd actually written down some tasting notes. It came at some point in an evening of drinking with Rob from Hopzine.com and Mark from The Sparrow which was only supposed to last for 'a couple', but ended up being a fair few. For those who don't know this beer, I'll start off by saying it's a pretty rare one that isn't exactly readily available in the UK. But, there are still some bottles kicking around in some of the really good craft beer bars and independent retailers, so if you like the sound of it then all is not lost. The name Red & White comes from the unusual type of beer that has been produced: A 10% abv Belgian-style witbier brewed with coriander and orange peel and fermented with pinot noir juice. According to Dogfish Head's website a fraction of the fermented beer is then aged in Oak casks, and then, I can only assume, mixed back in with the un-oaked batch to create a more rounded beer. This smells sweet and dry with loads of clove and lemon. The taste is balanced, lightly sweet, and specked with the flavour of coriander in the front and banana in the background. The finish is boozy, with banana, white pepper, orange pith and a huge white wine dryness that is extremely crisp but not tart. Throughout the drink there's a definite white wine character lingering, a dryness, and the occasional note of fino sherry. For it's abv and complexity it's actually extremely moreish and drinkable, with a character that changes and develops as your palate adjusts, though there's a lick of alcohol which begins to come to the fore as it warms which is a little distracting. Drink this chilled, from a wine glass, and you'll get a lot out of it, with that big bottle making it perfect for sharing. How do you turn people on to beer?